The YB-52 lifts off from Boeing Field on its maiden flight Boeing Company photo. Fifty years ago today, one of America's greatest warplanes took to the air for the first time. At 11:09 AM on Tuesday, April 15, 1952, the YB-52 Stratofortress, the first of its kind to fly, began rolling down the runway at Boeing Field near Seattle, Washington. Moments later, test pilot Alvin "Tex" Johnson and his co-pilot, USAF Lt. Col. Guy Townsend, got the huge plane airborne while Bill Allen, Boeing's president, waved his arms and yelled, "Pour it on, boy!" The Stratofortress got its start with a 1946 Air Force contract for a new bomber, designated as the XB-52. The Air Force wanted a new plane capable of delivering atomic bombs to distant targets. This was in the days when the Cold War was just beginning: hydrogen bombs and ICBMs still lay in the future. The long-range strategic bomber was still the ultimate method of projecting military might. 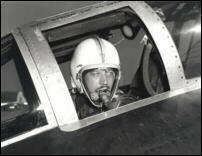 Boeing test pilot "Tex" Johnston in the cockpit of the YB-52. Boeing Company photo. It may seem hard to believe today but back then the Air Force did not believe jet engines could do the job and specified a conventional straight-wing aircraft powered by six turbo-props engines. In 1948, the bomber contract was awarded to Boeing and the project was given to Ed Wells, vice president of engineering. Wells and George Shairer, chief of aerodynamics, knew jet technology was up to the task, so they prepared two proposals for the Air Force. The first was a turbo-prop plane with a conventional design. The second proposal called for jets. On Thursday, October 21, Boeing engineers showed their turbo-prop design to the Air Force. The meeting took place at Wright Field AFB near Dayton, Ohio. George Shairer presented the concept, assisted by Boeing engineers Art Carlsen and Vaughn Blumenthal. Colonel Pete Warden, chief of bomber development for the USAF, was disappointed by the projected performance. He asked if the Boeing team had a proposal for a jet-powered aircraft. Shairer had the jet designs with him and called Ed Wells to join him in Ohio. Wells arrived in time to help Shairer, Carlsen and Blumenthal to quickly develop a presentation based on the jet. 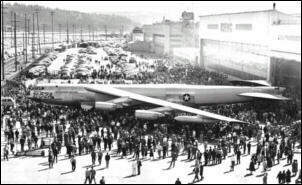 The first B-52A is rolled out at Boeing's Seattle plant on March 18, 1954. In order to clear the hangar doorway, the plane's 48-foot-high tail had to be folded down. U.S. Air Force photo. but did not alter the basic fuselage and wing design. This design also failed to provide the desired performance. By now, it was noon on Friday. The Boeing team promised Col. Warden they would be back on Monday with an improved design. Wells, Shairer, Carlsen and Blumenthal were joined by two other Boeing engineers, Bob Withington and Maynard Pennell, at the Hotel Van Cleve. The six men worked through the weekend on a new design with swept-back wings and eight jet engines. A trip to a hobby shop provided the materials to create a model and a stenographer was hired to type the proposal on Sunday. On Monday, October 25, the Boeing team presented the new design to Col. Warden. Warden was impressed and said; "Now we have an airplane. This is the B-52." 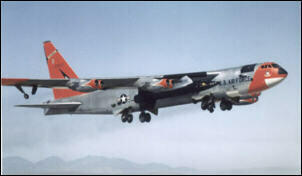 The B-52B was the first production model to enter full military service. In 1957, these three B-52Bs made a record-setting non-stop flight around the world. The planes were assigned to Castle AFB in California. Boeing Company photo. The Air Force approved the changes and ordered two prototypes, designated XB-52 and YB-52. The Boeing design worked so well in early testing, the Air Force issued a letter of intent to proceed with the manufacture of the new bomber over a year before the first fully operational prototype was delivered. Over the course of the plane's development, the design changed very little. The plane that flew in 1952 looked almost the same as the 14-inch scale model the Boeing team had built over that weekend in Dayton. The XB-52 was supposed to be the first to fly, but it was damaged during testing, so the YB-52 made the first flight. The flight lasted two hours and fifty-one minutes and was the longest maiden flight of any previous Boeing aircraft. The plane performed just as the specifications developed by Wells, Shairer and their team had predicted. Not all Stratofortresses served as weapons. In 1959, the last B-52A was modified to serve as a flying launch platform for NASA'a X-15 rocket plane (seen under the starboard wing). It was redesignated as NB-52A. Boeing Company photo. and the delivery of the first B-52A, there were some changes made. The bubble canopy of the original concept, adapted from Boeing's B-47, was replaced by a more conventional cockpit layout. Engineering changes enhanced fuel capacity and range. Only three B-52As were built, all were used for advanced testing. 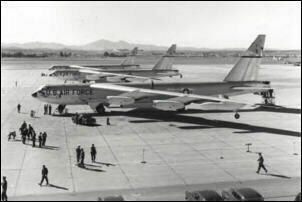 Counting all versions, including the XB-52 and YB-52, Boeing built a total of 744 Stratofortresses 1951 to 1962. The last new B-52, an H-series with tail number 61-040, left Boeing's Wichita production line on June 29, 1962. 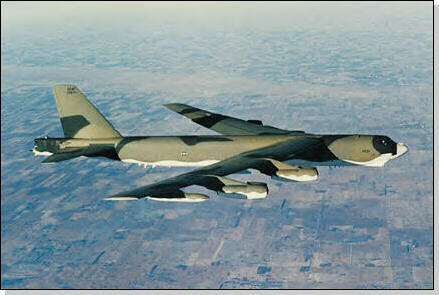 A B-52H in flight. Note the many changes to the plane's overall shape to accommodate new electronic systems. Boeing Company photo. While the B-52 has played a part in almost every American military action since the Korean War, we can all be grateful it has never had to perform the role for which it was originally designed; the delivery of a nuclear weapon. The Stratofortress first saw combat on June 18, 1965. That day, thirty B-52Fs flying from Anderson AFB on Guam used conventional weapons to attack Viet Cong positions. It was again called upon during Operation Desert Storm in 1991 and in U.S. operations in the Balkans. In its current support role in Afghanistan, the B-52 has delivered a wide variety of conventional munitions including bombs and missiles. Although the Stratofortress has been flown in just three percent of the sorties, it has delivered thirty-five percent of the total ordnance. It has also been used to drop propaganda leaflets from a specially designed container. 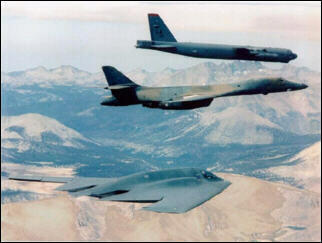 Modern Air Force bombers in flight together. Front to back: B-2 Spirit "Stealth", B-1B Lancer and B-52 Stratofortress. U.S. Air Force photo. Air Force aviators as the grandchildren of the original pilots reach the age of military service. And its presence on the front lines of America's national defense is likely to continue well into the future. Even with the addition of the more modern B-1 and B-2 bombers, the Air Force plans to keep the B-52H operational for another forty years. Of course, today's B-52H is much different from the first B-52A. New avionics and electronic warfare systems have added a number of bulges and protuberances. In addition, upgraded engines, increased range and capacity, and expansion of its mission capabilities have ensured the B-52's ability to meet the changing demands of modern warfare. Depending on the configuration, it can carry up to fifty-one 500-pound bombs or up to twenty air-launched cruise missiles with a variety of payloads. The modern Stratofortress has a range in excess of 10,000 miles and an operational ceiling of 50,000 feet. Its eight Pratt & Whitney TF-33 turbofan engines give it a top speed of 650 mph. To give you an idea of how effective the Stratofortress can be in modern military operations, consider this: On January 16, 1991, seven B-52Gs took off from Barksdale AFB in Louisiana. They began air combat operations in Operation Desert Storm by bombing targets in Iraq. When they returned to Barksdale, they had flown 14,000 miles. The planes remained in the air for 35 hours, the longest air combat mission in aviation history at that time. On April 12, 2002, Boeing held a ceremony to honor the golden anniversary of the Stratofortress' first flight. In attendance were Guy Townsend, the co-pilot on that flight, Pete Warden, the Air Force colonel who gave the initial approval to the project and Bob Withington, a member of the Boeing team that created the B-52 design over that busy weekend in Dayton, Ohio. At the ceremonies, Lt. Gen. Tom Keck, commander of the 8th Air Force, said, "Every major conflict since the Korean conflict has witnessed the incredible and deadly combat power of the B-52. Today's war on terrorism is no exception. It's a glorious history for this marvel of aviation, and the future looks every bit as bright,"
So, Happy Anniversary to BUFF; Boeing's Unbeatable Freedom Fighter! Best wishes for many more. All images credited to Boeing are copyright © 2002 The Boeing Company and are used by permission.